Looking For A Bachelor Party Bus In Hawaii? Gentleman, get ready for a night on the town. Throwing a bachelor party? Oahu Party Bus is here to help you celebrate your special night in luxury and style. Ride through Honolulu city with your very own exclusive nightclub on wheels. If you’ve caught a glimpse of the all black Oahu Party Bus rolling thru the evening streets then you know, this is where the party starts and does not stop. As Hawaii’s finest party bus rental service, every minute of our time with you is a moment to enjoy the ride. The Bachelor Party Bus escorts your groom-to-be and friends to the hottest of clubs and restaurants – either through our guide recommendations or your choice. The flexibility is yours. We provide top quality buses transformed into a state of the art vehicle. What does that mean? The sound system is of top notch quality. Seating is made for comfort plus interior hardwood floors and mirror tinted windows will have you feeling like you are in your own Private Nightclub. There are even two metal poles holding up the roof for your fun and a dancing pole for your pleasure. As a complete service bus vehicle, we are able to accommodate you and your entire group. It’s not a party unless everyone can come along! 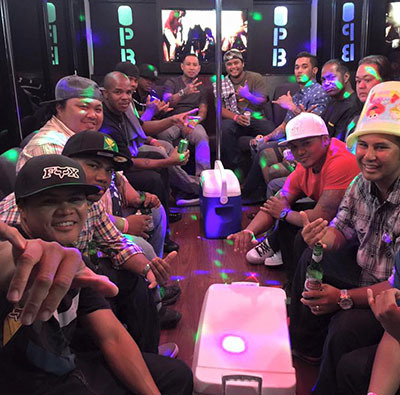 With Oahu Party Bus, you are transported to another world – one that allows you to have non-stop fun and takes you to your destination safely. From the moment you enter your ride for the night to the minute everyone returns home, we are are going to get you home safe, that`s what we do! Make it a night to remember for the special bachelor. Looking for something for your lady? Well we got you covered. Checkout our Bachelorette Party Bus.